June 1, 2017, New Delhi, India: The issue of service charge at restaurants and hotel has been a hot topic of discussion over the past few months with the Department of Consumer Affairs issuing an advisory against mandatory service charges. The restaurant association have been at loggerheads with the Government saying that they will keep adding a service charge to bills till the government passes a law against it. But it looks like citizens have now starting to stand up against these forced charges by hotels and restaurants. 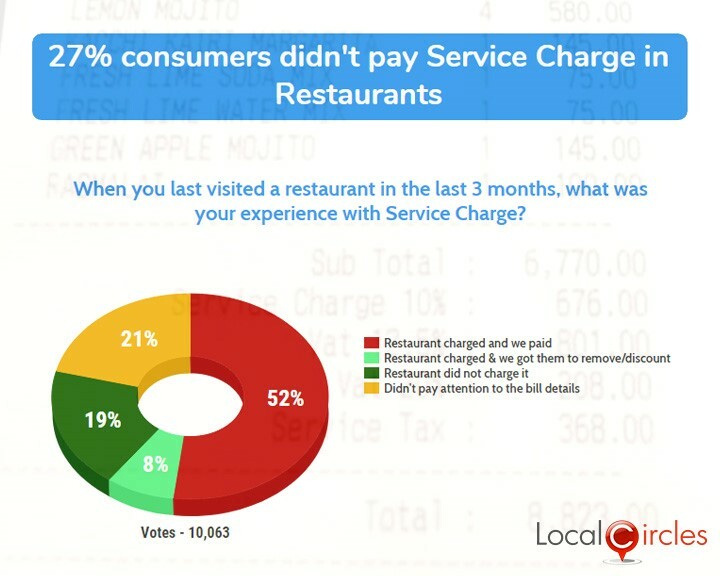 A poll conducted by citizen engagement platform LocalCircles found that 27% of the 10,063 citizens who visited a restaurant in the last 3 months did not need to pay a service charge. 21% said that they did not pay attention to the bill whereas 52% citizens said that the restaurant bill included a service charge and they had to pay it. In an earlier poll, 89% people had said that service charge at restaurants should completely be removed. In the event service charge cannot be removed, 68% people in the second poll agreed to have an optional service charge model where a yes/no option for paying a service charge are presented to the customer on the proforma bill.